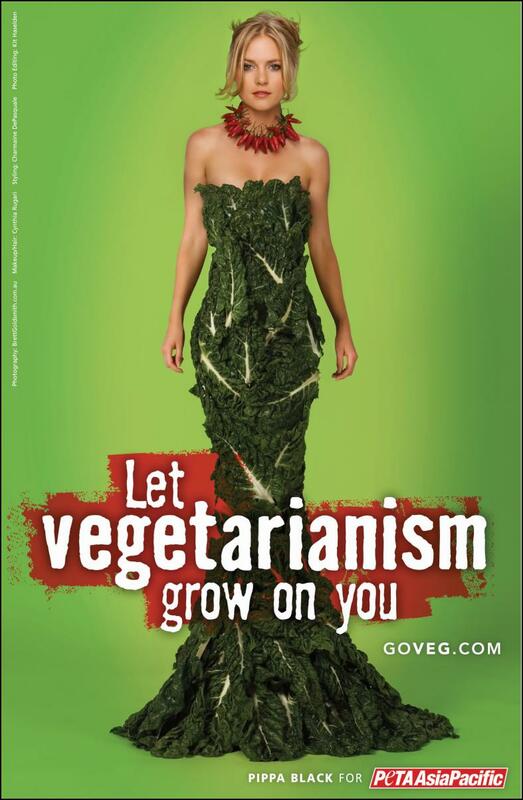 Sydney – Wearing a spectacular full-length gown made of lettuce and accessorised with a red chilli pepper choker – next to the tagline "Let Vegetarianism Grow on You" – vegetarian actor Pippa Black stars in a brand-new ad for People for the Ethical Treatment of Animals Asia-Pacific (PETA). The ad was shot by celebrity photographer Brett Goldsmith (Brettgoldsmith.com.au) . Black – whose role as Elle Robinson on the Ten Network's Neighbours earned her a nomination for Most Popular New Female Talent at the 2006 Logie Awards – says going vegetarian was one of the best decisions she's ever made. "Of course, going vegetarian is a positive step to help stop animal suffering; it's also great for your health and the environment", says Black, who put her studies in animal technology on hold to pursue an acting career. "I just feel better since I stopped eating meat, and when you feel better, I think you look better too." Looking better is right. Australia has the second-highest obesity rate in the world – nearly 60 per cent of adults and more than one-fourth of children are considered to be overweight or obese. 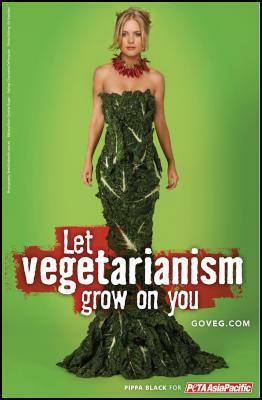 Numerous studies have found that vegetarians are on average markedly leaner than meat-eaters. Consumption of meat and other animal products has also been linked to heart disease, diabetes and some kinds of cancer. Pigs in factory farms endure castration and tail-docking and have their teeth broken off – all without any painkillers. Cows are confined to muck-filled lots and are repeatedly impregnated. Their newborn calves are torn from them and relegated to tiny, filthy veal crates. Chickens and turkeys – more than 400 million a year – are crammed into huge, windowless sheds and are killed for their flesh when they're just months old. Laying hens are packed so tightly into cages that they cannot even stretch a wing. 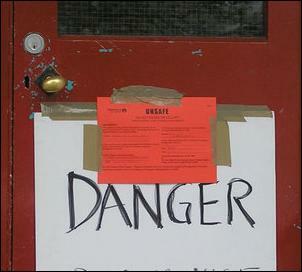 At abattoirs, many animals are scalded or dismembered while they are still alive. Black joins a growing list of celebrities who have kicked the meat habit, including Missy Higgins, John Butler, Pamela Anderson, Sir Paul McCartney, Sophie Monk, Tobey Maguire and Australian Idol host Andrew G.
Find more from PETA Asia Pacific on InfoPages.